Obviously, number one on the list is Longwood Gardens. This unique tradition has put me in the holiday mood since early childhood, although it only gets better with age and with Longwood’s innovations! You’ll recognize the light display from Route 1 as you exit for the festivities. Trees, expertly decorated with twinkling lights, usher you in as a siren song to what awaits you past the entrance. In addition to the expansive outdoor light exhibitions, Longwood also provides rustic outdoor bonfires where you can pause to warm up along your walk. Christmas shows, wandering carolers, and organ concerts number among the festive events that make Longwood such a magical destination for holiday visitors. Of course, once you enter the conservatory (and let’s be honest, I’m here more quickly than I’d like to admit as I can’t stand the cold), you’ll be embraced with the red, green and gold colors of the season. Take off your gloves and scarves and enjoy the floral masterpieces. 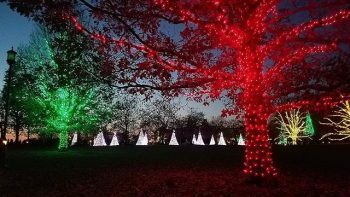 You will want to get your tickets in advance as space fills up quickly during the Holiday season which runs through January 6th. Next, check out the Brandywine Art Museum for some new exhibitions. First exhibition, Brandywine Christmas, showcases the region’s greatest model train railroad. This display is fun for all ages, and includes several decorated Christmas trees as well. 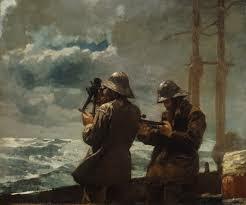 Brandywine is also featuring Winslow Homer: Photography and the Art of Painting. This exhibition will delve into the use of photography as inspiration and guidance for Winslow Homer’s photorealistic paintings. The final stop on its’ tour, this exhibition arrives here from Bowdoin College Museum of Art. Homer would often recreate the photograph in different media as a painting or as a print. There’s a saying that you don’t really know something until you paint it, and as an artist myself, I believe there is truth to that saying. Check out this exhibition while it’s on display through February 17th. Next, take a Saturday to enjoy the festivities in Malvern as Gallery 222 hosts “Dueling Paint Brushes: A One Day Indoor Plein Air Event” to coincide with the Holiday events on King Street. Local artists will participate in three rounds of timed painting with a different subject matter featured in each gallery. Local artists include: Elise Phillips, Randall Graham, Monique Sarkessian, Jan Wier, Denise Sedor, Sarah Baptist, Nancy Bea Miller, Jeremy McGirl, David Ohlerking & Kristi Gilfillan. Timed painting sessions start at: Noon, 2:30pm, and 5:30pm with a reception from 6 – 8pm. Gallery 222 will also be featuring a Small Works Show until Christmas Eve featuring work for sale from $8 – $500. Pick up some unique gifts of those arts appreciators in your circle. If you are in West Chester, stop by Art Trust for a similarly themed exhibition, “Gifted,” which fill feature affordable art between $25 – $500 for sale through January 11th. Stop by for some First Friday shopping on December 7th from 5 – 8:30pm. Happy Holidays from Mixed Media! May your season be merry and filled with art. Until next time!